As summer starts to heat up and people are coming out of their homes to soak up the sun, we found ourselves wondering what to do with all the glorious daylight. Thankfully, Mariah Stewart, author of the Chesapeake series, gave us a list of five of what she calls VIT (Very Important Things) to fill those long summer days. 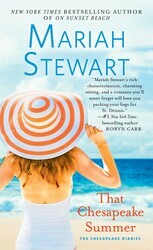 Mariah’s new novel, Driftwood Point, is on sale now! So much to love about summer! So much to look forward to! So much that I’ve had to make lists to keep it all straight. Here’s my list of five VIT (Very Important Things) that I cannot miss. ~ 1st – of course! – DRIFTWOOD POINT, my second chance at love story (because everyone deserves a second chance). #10 in the Chesapeake Diaries. ~ 2nd – Jennifer Probst’s EVERYTHING AND EVERY WAY was so crazy delicious that I cannot – CANNOT – wait for that second book in her Billionaire Builders series, ANY TIME AND ANY PLACE (Note to my editor: I am not too proud to beg for an early copy. Just sayin’). ~ 3rd – Linda Castillo’s AMONG THE WICKED – I started reading her Kate Burkholder series with the first book and have read every one since. We live among the Amish, and I can tell you – she gets it right. ~ 4th – Susan Mallery – DAUGHTERS OF THE BRIDE – the title alone is enough to make me want to read this. ~ 5th – Nancy Herkness’s THE ALL STAR ANTES UP – I’ve read several of her contemporary romances and love her style – and I’ve heard this new series is hot stuff! Blueberries (as in cheesecake), peaches (as in cobbler), watermelon (as in salad – had to get something healthy into the mix! ), and since we live in the country, it can’t be summer without fresh sweet corn. ~And yes I know they’re all old songs – I prefer to think of them as classics. No mystery here – the beach and the pool in the backyard. Game of Thrones – I’m watching all the Season 6 episodes so I’ll be totally caught up when Season 7 begins – and hopefully by then I’ll not have forgotten who lived, who died and came back to life, who stayed dead, who went to war, and who walked naked through the streets of Kings Landing. So there you have it. What’s on your list of Summer 2016 can’t misses? 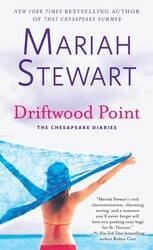 The 10th addition to Mariah Stewart's beloved Chesapeake Diaries series, DRIFTWOOD POINT is the romantic tale of a man who takes a second chance on love with the high school crush who broke his heart. As environmental engineer Alec Jansen up-and-coming artist Lisbeth Parker fight to win the debate over their island's future, they also fight to win something else: each other.